As NASA prepares to launch its latest and most ambitious mission to study the Sun, it will join NASA missions launched to study Earth’s closest star. Since its creation in 1958, NASA has made the study of the Sun one of its priority. Given the importance of the Sun for all life on Earth, this mission’s importance becomes clearer. The first orbital spacecraft to take advantage of the newly-available perch of space were NASA’s Orbiting Solar Observatories. The Orbiting Solar Observatories were a series of eight spacecraft launched by NASA between 1962 and 1975. “When you can get your instrument above the atmosphere, you begin to be able to see things you couldn’t see before,” said Keith Strong, heliophysicist emeritus at NASA’s Goddard Space Flight Center on Phys.org. 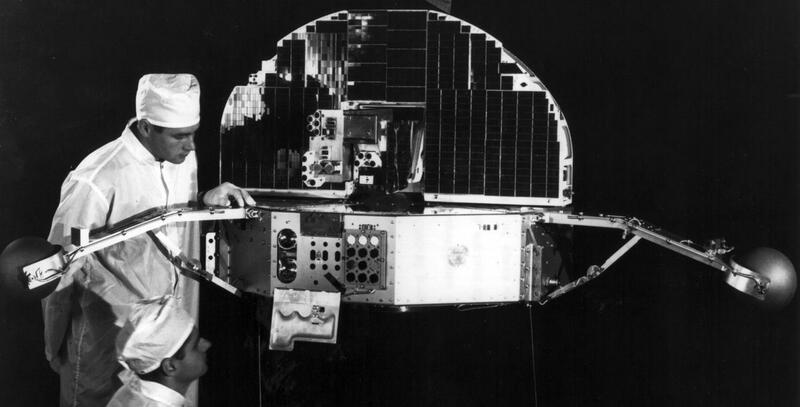 The first seven of the OSO spacecraft were all manufactured by the same company, the Ball Brothers Research Corporation (now Ball Aerospace), and had much in common. OSO 8 was constructed by Hughes Space and Communications Company. The OSO series had two distinct sections, the wheel and sail section. The wheel section was the main mass of the spacecraft and consisted of a single nine-sided “wheel” and three radial arms. The wheel section carried five experiments that did not require that they be pointed at the Sun to operate. The wheel section also contained the power supply, the tape recorder, and communications systems. The three radial arms extended from the wheel sections ended in a spherical tank of nitrogen gas and a set of spin control thrusters. The sail section was a semicircular “sail” over the hub of the wheel section. When the spacecraft was in orbit and in operation, a special motor would torque against the spinning wheel section, allowing two instruments mounted in the bottom of the sail section and the solar panels mounted on the face of the sail to keep it directed toward the Sun. The sail also contained the pitch control jets and the gas that powered them. The first OSO to launch was OSO-1 on March 7, 1962. It was sent aloft atop a Delta rocket from Cape Canaveral Air Force Station, LC-17A. OSO-1 added enormous amounts of data to the literature about the Sun that could not be observed from Earth before it ceased communications on August 6, 1963. The second OSO spacecraft encountered a serious anomaly on April 14, 1964 when its solid-fueled Altair-2 third stage ignited while the spacecraft was undergoing a spin test, killing three technicians and injuring eight more. A replacement spacecraft was assembled, designated OSO-B2, and launched aboard a Delta C rocket from CCAFS, LC-17B on February 3, 1965. The spacecraft was despun and re-entered Earth’s atmosphere on August 8, 1989. The third OSO also dealt the program a serious setback when the Delta rocket carrying it exploded shortly after the second stage burn on August 25, 1965. The third stage did manage to separate, it lacked the thrust required to place the payload on orbit and it burned up in Earth’s atmosphere. The replacement OSO-3 launched on a Delta C rocket from CCAFS LC-17A on March 8, 1967. This spacecraft, and the one after it, differed from the previous two in having a magnetorquer, an electromagnet that could maintain a spacecraft’s attitude by exerting a torque against the Earth’s magnetic field. OSO-3 stopped data transmission on November 10, 1969 and re-entered Earth’s atmosphere on April 4, 1982. OSO-4 (OSO D) was launched on a Delta C rocket on October 18, 1967 from CCAFS LC-17B. OSO-4 began to suffer problems and was placed into stand-by mode in November of 1969. It was turned on occasionally to record special events, but failed permanently on December 7, 1971. OSO-5 (OSO F) was launched on a Delta C1 rocket on January 22, 1969 from CCAFS LC-17B and operated until July of 1975. OSO-6 (OSO G) was launched on a Delta N rocket on August 9, 1969 from CCAFS LC-17A and operated until January of 1972. OSO-7 (OSO H) was also manufactured by Ball Brothers, the same company responsible for the famed Ball mason jars, but was a significant departure from the previous six spacecraft. It had a larger, more rectangular sail, and was primarily designed to investigate the Sun in the UV spectrum. 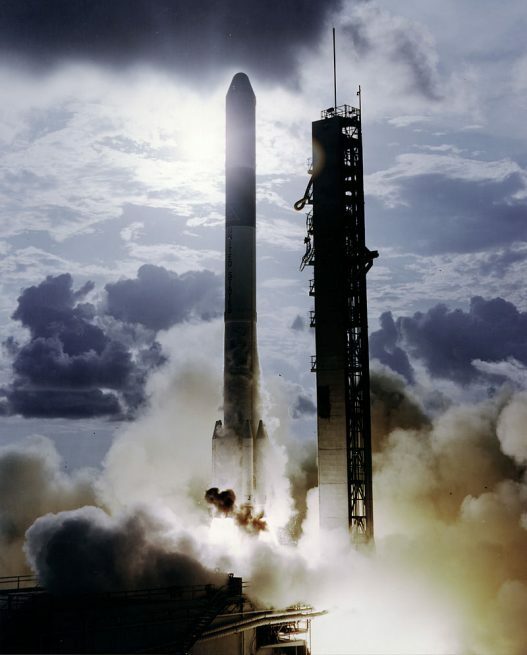 It launched on a Delta N rocket on September 29, 1971 from CCAFS LC-17A. Its tape recorder failed in May 1973, but real-time data continued until the spacecraft re-entered on July 9, 1974. OSO-8 (OSO I) was manufactured by Hughes Space and Communications Company, based on a canceled follow-on to the Orbiting Solar Observatory program called the Advanced Orbiting Solar Observatory. OSO-8’s wheel section was cylindrical, while the three radial arms remained. The sail section became much tall and more rectangular. The Orbiting Solar Observatory program was one of the first series of solar science programs that was conducted by NASA, and quickly revealed the utility of studying the Sun from outer space and opened the way to a long history of NASA missions to studying the Sun. The Sun is the source of almost all of the energy that the living things on Earth’s surface use to live, but the energy contained within the Sun is billions of times greater than what life on Earth uses to survive. As astronomers have studied other, more distant stars, they have seen some of these stars bathe their planets in deadly radiation. It it thus important for us to discover what distinguishes our Sun from these other stars, and to understand the evolution of our parent star as it ages. Studying the Sun could also help us unlock the secrets of these other shining celestial bodies – and the worlds that orbit them. There are countless reasons that NASA is sending the Parker Solar Probe to study the Sun – and add to the wealth of knowledge gained from the missions of its predecessors.